Something has gone horribly wrong in Wonderland. Can Alice save her once-beautiful refuge - and herself - from the madness that consumes them both? • Overcome unimaginable evil with an arsenal of unusual weapons, including the legendary Vorpal Blade. • Wonderland’s most famous residents are back - but not necessarily as you remember them. 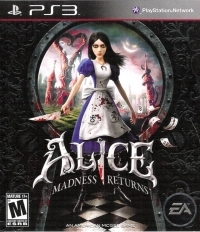 Online Pass - Activate your Alice: Madness Returns Online Pass to access a bonus download of the original American McGee’s Alice. 05-23-2017 silverbow Box Text We’re All Mad Here Something has gone horribly wrong in Wonderland. Can Alice save her once-beautiful refuge - and herself - from the madness that consumes them both? [image captions] • Overcome unimaginable evil with an arsenal of unusual weapons, including the legendary Vorpal Blade. • Wonderland’s most famous residents are back - but not necessarily as you remember them. 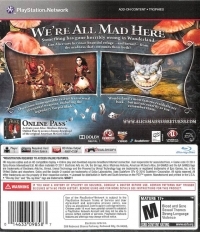 Online Pass - Activate your Alice: Madness Returns Online Pass to access a bonus download of the original American McGee’s Alice.